On October 7, 2007, the Archbishop of San Francisco George Niederauer, a protegé of Benedict XVI, said Sunday Mass at Most Holy Redeemer Church (MHR), a parish with a high attendance of homosexuals. At the Mass members of the mock "religious order" that calls itself the Sisters of the Perpetual Indulgence were present. Such organization is composed of male homosexuals who ridicule Catholic Morals and promote all kinds of sexual perversions. At Archbishop Niederauer's Mass two men of this "order" dressed in extravangant apparel approached to received Holy Communion, and were given the Eucharist by Niederauer, above, and first and second rows below. "At the Most Holy Redeemer Church on October 7, I noticed no protest, no demonstration, no disruption of the Sunday Eucharist. The congreagtion was devout and the liturgy was celebrated with reverence. Toward the end of the Communion line, two strangely dressed persons came to receive Communion. I did not see any mock religious garb. As I recall, one of them wore a large flowered hat or garland." So, Niederauer pretends that there was no mockery or possible disrespect for the Holy Eucharist in giving Communion to two men dressed as nuns with heavy white make-up on their faces, see below third and fourth rows. This is not an acceptable excuse, since as the Shepherd of San Francisco, he should know, as everybody else does, that this blasphemous organization - the Sisters of Perpetual Indulgence - is a very visible and well known group of practicing homosexuals at MHR. In the third row the two men can be seen in the pews, in the fourth row, they advertise their organization before the "coffee and donuts" gathering after Mass. 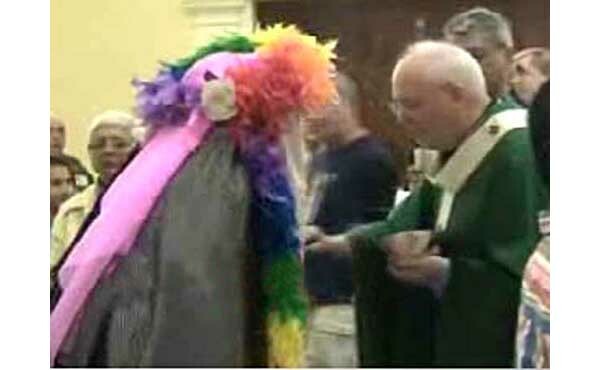 Here you can watch a video of the two so-called "Sisters" receiving Communion. To have an idea of the "Sisters of Indulgence" activities click here to see a bingo they sponsor that was first instituted in the MHR parish hall, and then transferred to another place, but be aware that there is indecent propaganda.